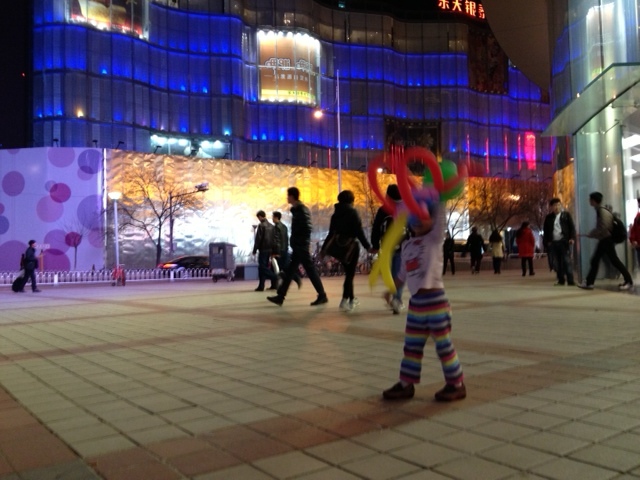 Last night was cold with a brisk wind blowing through Wangfujing. The wide pedestrian boulevard lined with high-end international stores mixed with interesting local stores remained popular nonetheless. People milled around walking to stores, buying street-side food, or simply gawking at the splendor of it all. In the middle of all the chaos were a seemingly local father and his young son, probably about seven, hanging about shooting an LED-lit sling-copter into the air. They were in our path to the store across the boulevard, and as we got near, the father stepped forward with a big smile and stooped down to offer a butterfly made of twisted balloons to my 2-year old daughter Saachi. The son curiously looked on. I looked over with concern to the son and asked him, “Are you sure you want to give this to her?” He eagerly nodded in the affirmative. Generous little soul! Saachi was intrigued but too shy to accept the gift. I asked her to take it graciously and say thank you, but she just wouldn’t raise her hand to take it even though she kept walking closer to it and was clearly interested. So I took it for her, gave both of them our thanks and continued to walk forward. Saachi was delighted with her gift and immediately proceeded to throw the butterfly around up in the air. Meanwhile, I watched the father and son calmly go and sit down on a bench with their backs to us, slightly leaning into each other and talking. There was something magical about their rapport and the value of that time the dad was spending unhurriedly, just hanging out with his son sharing the simple joys of playing and giving while the rest of the world swirled around. Thank you Rekha! 🙂 Your appreciation is very encouraging! Beautifully articulated Smita – was really touching! Thanks Geetika 🙂 It was a touching experience!